The design takes local climatic conditions into account and draws inspiration from traditional Taiwanese bookcases. A series of ‘shells’ is created on the elevation to ‘encase’ European culture. The ‘shell’ shading system of laminated bamboo reveals the cultural feature of Yangmingshan. It maximises natural light and provides shading to the functional spaces, greatly reducing a reliance on artificial lighting and air conditioning. 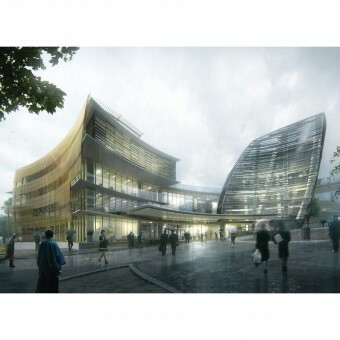 Located in the beautiful Yangmingshan and adjacent to the famous Taipei Hwa Kang Arts School, the redevelopment of Taipei European School’s secondary campus by Aedas sits on a site totalling 16,030 square metres. 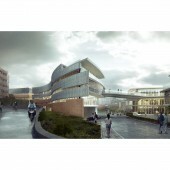 It is envisioned to create a contemporary, vibrant campus with rich Taiwanese cultural elements. Taipei European School (TES) is an independent, co-educational day school, which was formed through the amalgamation of The Taipei British School (TBS), Ecole Française de Taipei (EFT) and Deutsche Schule Taipei (DST). It now operates as a single European entity through a non-profit making Foundation. The school has attracted worldwide attention with its unique model for integrating British, French and German sections in terms of curricula, administration, finance, buildings and facilities. A rapidly-expanding school, TES is now home to 1,700 students from 50 different nationalities. Following the success of this integration model for younger children, it was further enhanced when our High School was opened in 2002, catering for students from all three school sections. Since the development of the High School Section and introduction of the prestigious International Baccalaureate (IB) Diploma, a graduating cohort of students gain places at many of the top universities around the world, principally in the UK, France, Germany, the Netherlands, USA, Canada, Australia and Taiwan. 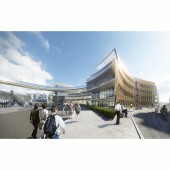 Taipei European School School by Aedas is a Nominee in Architecture, Building and Structure Design Category. · Click here to register today inorder to be able to view the profile and other works by Aedas when results are announced. Taipei European School School by Aedas is Winner in Architecture, Building and Structure Design Category, 2016 - 2017. 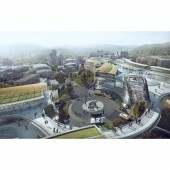 · Press Members: Login or Register to request an exclusive interview with Aedas . 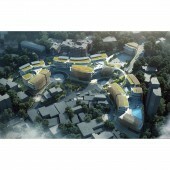 · Click here to register inorder to view the profile and other works by Aedas . Did you like Aedas's Architecture Design? Did you like Taipei European School School? Help us create a global awareness for good architecture design worldwide. Show your support for Aedas, the creator of great architecture design by gifting them a nomination ticket so that we could promote more of their great architecture designs.